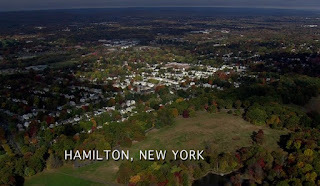 Which is nice and all, but then we head over to the state hospital for the mentally disabled, which is almost certainly not in Hamilton, NY, making the previous shot weirdly dishonest. The victim wonders why Derek and company didn't come to rescue her sooner, which I'd say was ungrateful, but it doesn't seem like they rescued her at all. Unless it was Derek driving the car that hit her, which is a distinct possibility. Time for a quick plane scene, with some victimology - the two female victims were raped, but Ben, the third victim, was not. Also, one woman was black, and the other was muslim - could this all be about generic hate crimery, which would suggest that Ben was gay? They even mention the death of Matthew Sheppard, because that guy was tied to a fence, and Ben was scarecrowed. When Smallville built its whole first-season marketing around exploiting the iconography of that hate crime, I was disquieted, but exploiting real-life tragedy is Criminal Minds raison d'etre, so I'm more willing to give it a pass here. The victim then talks about how her friend would have no doubt been punished for planning the escape - we even get a flash-over to that happening. Which is strange, again, because neither the victim nor Derek was there for that. Troublingly, the punishment is happening during the day, which suggests that it's at least eight hours later, meaning that Derek probably didn't hit her with the car, since that would have only happened if they were on their way to the murder farm anyways. Also, now that I think about it, they tried to escape the night Ben was scarecrowed, and Derek didn't show up in town until the next day, so it was kind of silly of me to think that he could have been driving the car. 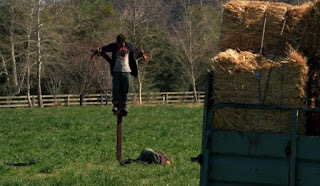 JJ and Derek go to the field, and discuss the fact that there must have been more than one killer, simply because it would be too much of a hassle for one person to drag a body out into the field and put them on a scarecrow in the middle of the night. Also, since the scarecrow was quite a few feet off the ground, they must have used a ladder of some kind to be able to lash his arms in place - that's my observation, although it's probably not a useful one, since it's not like ladder foot treads are traceable. Or are they? Over at the autopsy, Reid notices that the four-pronged wounds don't all match, and were more likely caused by an icepick carefully wielded than they were a farming implement. Also the fact that they're the diameter of an icepick probably should have tipped you off to that, since there's no farming tool made up of four thin rounded daggers. Reid's conclusion: The killer must have OCD! Which I'm sure will be helpful in tracking him down, since there are government records of that, right? Also, the victim confirms the supposition in the present day, since one of the killers loved to clean! But in the flashback it's the not-neatness-obsessed one who's revealed to love stabbing people with icepicks, so doesn't that blow the whole 'OCD' thing right out of the water? First off, you don't know where the crime scene was. You only know the dump sites, which is a different thing. Also, one woman was dumped in an alley, another ditched on the side of the road, and the man was scarecrowed in the middle of a field, with the actual scarecrow left dumped at his feet. None of these locations match any definition of clean or neat. Then the team gets word that the victim has arrived in the hospital! She's awake just long enough to tell them about the other victim who needs to be rescued! Of course, we saw her being loaded into the trunk of a car so that she can be killed in the middle of nowhere, so their chances of finding her aren't fantastic. In the hallway, Greg worries that the killers might already be looking for another victim, which seems like a long-shot. I mean, they know that one of their victims is missing, and for all they know she's currently telling everyone exactly where their hideout is. Isn't the natural supposition that they'd be turning tail and running, or at least focusing on getting rid of evidence as quickly as possible? Also, no one seems focused on the most important thing - discovering exactly where she was hit by the car and found. Seems like this is the place where geographical profiling could actually help! See, during the edit someone noticed that a woman being hit by a car in the woods wouldn't necessarily have any connection to the murders, so they added in a line about her having similar chest wounds! In the present, the victim explains that the killers were charming enough to pick ladies up in bars! To prove this, they show a scene of him grabbing a lady who doesn't seem to be one of the victims we know about - is there another lady in danger, or am I really that bad with faces? Also, we see this other lady getting kidnapped while victim is telling the story, so again, whose flashback is this? Was she in the bar because she was in on the murders, or is this God giving us a POV of the past? The team tries to communicate with the victim in the ER, but she's unresponsive - the ER doctor thinks she may have amnesia! They're still not talking about where she was found, weirdly. Last week they found a serial killer entirely based on where his victim had walked, and that was in the middle of a city - how many places are there to check in the woods? The team all heads out to a rest stop where the latest victim has been displayed - it's the woman from the bar, who victim claims she never met - so when did this kidnapping happen? Did they go straight to a bar and grab a woman right after dumping Ben's body? I can't imagine another reason she wouldn't have seen the lady. Also, they show that this victim doesn't have OCD-level stab wounds, so I guess the icepick guy was directing OCD guy to use icepicks, but when he does it on his own, he's sloppy. So that makes sense? Where's Carrie (the other victim) during all of this? She was in the trunk of the killer's car when he drove off, but he also had this lady somewhere in the car to put on display? Also he went to the trouble of setting up a murder display in a public bathroom in the middle of the afternoon? That seems so far beyond risky as to beggar belief. Now it's time for the profile, which is - as usual - not at all helpful. Basically, they think there's a crazy guy out there, and he's getting reckless because his main victim (turns out she'd been held for like ten months!) has fled! While the profile is happening we see him club a guy on a surburban street in broad daylight, then bring him back to a house for a brutal stabbing execution. Presumably this is a new house that they fled to after the victim escaped, and the night time abduction of the woman happened the next night, and her body dump the morning after. 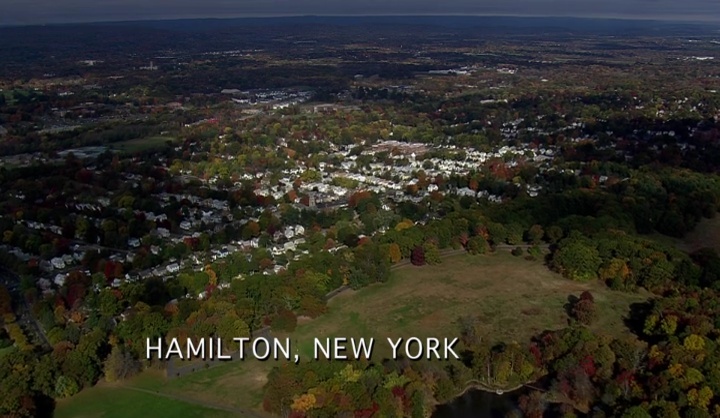 This kind of conflicts with the timeline in the rest of the show, however, since nothing about the team's scenes suggests that an entire day has passed since they arrived in town. Of course, keeping a close eye on timelines has never been this show's strong suit, has it? The world's most useless geographical profiling scene (Reid bases it on dump sites and where the victims lived, not, you know, where their escapee was found) is interrupted by the news that the victim's sister has arrived! It seems the victim was grabbed almost a year ago! They hypnotize her to take her back to the day when her sister was kidnapped - it seems that she was walking her sister into work, when the killer hit on the sister out the window of his work truck! Apparently her memory is so good that she's able to recall the first four letters of his license plate, and that he was getting a work call about a furnace! That's an incredible feat of memory! Although, I've got to ask - a year ago, when your sister was kidnapped and you reported it to the police, did you not mention to them that the last time you saw her a strange man in a pickup truck was hitting on her? Doesn't that seem like the kind of thing that would have been relevant at the time? Fun fact, the license plate starts with KL5, which is probably a retro phone number joke! Finally we get to the part that explains why the victim is in a mental institution - the killer didn't abduct her, they went out on a date, and then he drugged, abducted, and brutally tortured her! And she gradually coped with the situation by 'falling in love' with the killer, which she thinks means that she helped cause all of the other killings! While that's true, in the sense that if you'd stabbed him to death during one of his unguarded moments all of those people would still be alive, you're not to blame if you were just doing whatever it took to survive, which is your natural instinct. The team rushed out to the house, and found it abandoned, with no clues about who his partner might have been! They get some info about the killer's tragic backstory, but none of it is super-relevant to the matter at hand. Luckily, they were able to get the partner's first name out of the victim, which allowed the team to cross-check him against people who the killer did time with! They rush to the partner's house - but can finding the killer really be that easy? Nope, that's also not the secondary holding area. They do get a credit card hit off of the partner, though, allowing them to arrest him at a gas station! The partner then claims to know nothing about the murders, and even gives them a location of where the killer must be - a client's cabin! The team is suspicious about how forthcoming he is, and Reid finds it strange that the partner's clothes and shoes aren't neat the way a person with OCD would be! His house was, though, which isn't explained. It's at this point that we notice that it's only the victim's testimony that ties the partner to the crime, which means that she was probably the other murderer, and she was the one with OCD! Also, there's an embarrassing scene which makes the show look super-cheap. 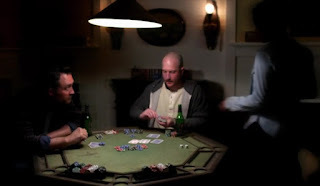 The partner mentions the victim is the killer's 'girl', who he sees when he's over there playing poker. You couldn't afford a couple of extras, show? This looks like the saddest poker night in history. In the past the team rushes out to the cabin and shoots the killer, who refuses to reveal his partner's name. Also, their hesitation before shooting the killer gets Carrie stabbed, although it's just in the stomach, so she may still be alive. Then Derek goes back to talk to the victim, hoping she can offer proof other than her word that Partner was really one of the killers. She can't, but he does notice her penchant for straightening out any wrinkles in her bedsheets - so she WAS the OCD killer after all! Time for the victim's confession that she killed people, and that she's still in love with the killer! What a reveal! It's undercut slightly by the entire premise of the episode, but we'll get there. Derek tells the victim's sister that she can't testify, and that she needs to stay in the hospital indefinitely - she's just too crazy to let out! Sort of! Making the OCD connection tipped them to the fact that the victim was in on it, but then again, the 'partner's house' we went to was also cleaned to an OCD shine, and there's no reason to believe that the victim was responsible for that. That seems like kind of a huge cheat to muddy the waters. Of course it could have. They found the victim on a road close to the killer's house. She gave them the name that led them to the second kill house. While it would have taken them a little longer to pin the crime on her without the OCD insight, inside the killer's house there was a box containing a bloody icepick with the victim's fingerprints on it. So the regular cops would have even gotten to that eventually! 3/10 - I'll give them credit for trying! But not much. Seriously, though, the framing of the entire episode was hugely deceptive, because the doctor at the beginning was like 'you're coming down to coach someone's testimony, that seems strange'. Except the doctor was the victim's psychiatrist. Who knows that she's treating the victim for mental trauma related to all the people she killed at the behest of her torturer. So there's no way on earth she would find it strange that a profiler as going to show up to help make the determination of whether or not she was too crazy to testify. The crazy part is, they didn't even have to lie at the start - they could have just had Derek ask the doctor's opinion, and had the doctor respond that her field is getting the victim back to normal, not ready for a trial - that would have kept the mystery going without trying to oversell the idea that this was just another day on the job for Derek, which it obviously wasn't. They were so scared of people guessing their twist that they felt they had to lie to their audience - which they absolutely didn't. Also, thanks for not telling us whether Carrie was alive and testifying at the trial, monsters. The videos weren’t uploaded correctly.